It's a special Monday night podcast, as the fellas are joined by AU super fan and TNT reporter David Aldridge to preview the Patriot League title game matchup vs. Lafayette. The season is still alive! The fellas recount in heavy detail the quarterfinal win over Lehigh; tell stories of the watch party on campus; and are joined by Travis Lay — the captain of the 2008 PL-winning team — to break down the semifinal matchup vs. Colgate. It's March and time for some madness. 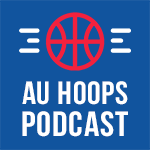 The fellas break down the Eagles' last two regular-season games at Bender; assess AU's chances in the PL tourney; and are joined by CBS Sports color commentator Chris Spatola and Eagles assistant coach Matt Wolff. The fellas don't mess around with their first two-day edition of the podcast, dissecting the Eagles' use of Gabe Brown; delving into all the Patriot League Tourney scenarios; and, last but not least, talking with award-winning Bucknell announcer Doug Birdsong about the Bison and all things Patriot League!